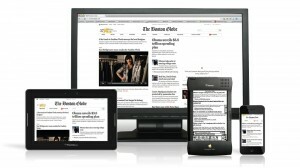 What is Responsive Web Design and why should you consider it for the design of your website? If your brand relies on a web presence and your website is not optimized for the latest mobile devices, you might be doing yourself a great disservice. As the popularity, affordability and ubiquity of mobile devices continues to rise, more and more people are using these devices to access the web. As website standards and browsers continue to improve, however, it’s becoming easier to build mobile-optimized websites — as opposed to purpose-built apps — to accommodate users who are visiting your website through their mobile phones. Since it’s no longer an option to just have a desktop version of your site, and if creating a mobile app is simply out of your reach, consider building your website with responsive design instead. Before we get neck deep, let’s dip our toes a little. Simply put, responsive design (RD) is a method of creating a site that allows it to expand and contract to fit the frame it’s given without sacrificing readability or usability. Here’s a fantastic example photo to visualize the concept courtesy of wikipedia. Sounds too good to be true, doesn’t it? It all started with a fairly simple theory from Ethan Marcotte in a 2010 article titled “Responsive Web Design.” Rather than creating a single webpage that is 800px across and centers itself on the screen, responsive webpages are composed of elements that size, shape, and place themselves based on the width of the browser screen. Elements determine the screen size using CSS media queries. One of the most exciting changes in website design has been the introduction of responsive design, a mechanism that allows a website to react to the size of the users screen and to adapt to the best fit. This is used to allow websites to fit the varied screen sizes that users have on desktop or laptops, but the real benefit has been its use for creating mobile friendly sites. So which devices are consumers buying? Tablets, for one thing. Tablet sales are expected to exceed 100 million this year. Tablet sales are expected to exceed 100 million this year. Their sales numbers may top notebooks next year. Smartphones, of course, are also a hot commodity — according to Nielsen, the majority of U.S. mobile subscribers now own smartphones, not feature phones. Here are reasons why some people should NOT have a responsive website. Responsive Web Design (RWD) is an approach to web design where the site is crafted to be optimally viewed regardless of screen size…no matter whether your visitor arrives by desktop, mobile device or tablet…now or any device in the future. While RWD offers a lot of potential benefits, the idea that it’s right for all web projects is ludicrous. I like Responsive Design. Heck, I LOVE Responsive Design. I think it’s a brilliant methodology, which address true challenges in a very good way. But no matter how fond you are of RWD, I think you have to face the music – RWD makes it very hard to write a fast website. After the huge debate this original post created, we decided to refine and build upon the original article, bearing in mind the thoughts of some very insightful feedback left by some commenters. You can find the new article here. In 2014, more people will be using mobile devices to access the internet than desktop PCs. Accessibility for mobile devices has become a huge priority for web developers.